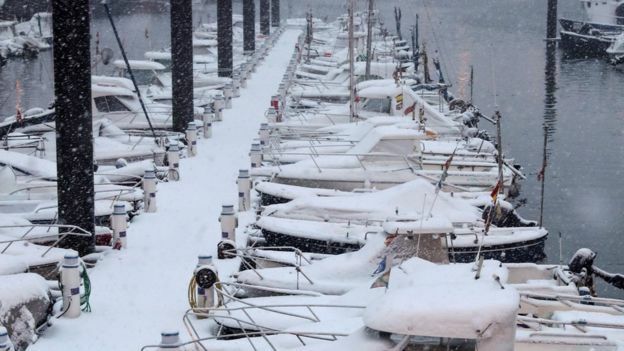 Much of Europe has been blanketed in snow as cold weather spreads as far south as the Mediterranean coast. The cold spell, nicknamed “the Beast from the East” in the UK, is carrying freezing winds across the continent, and temperatures as low as -30C (-22F). At least 10 people have died since Monday, including many who were sleeping rough in cities. Aid groups have opened shelters and are providing hot food and blankets for thousands of people. 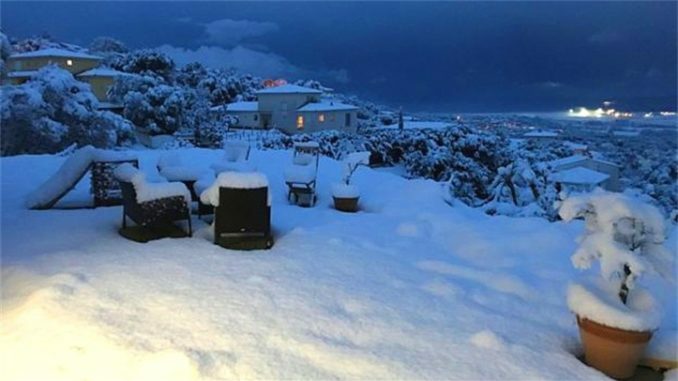 The cold weather – called the “Siberian bear” by the Dutch and “snow cannon” by Swedes – brought rare snowfalls to parts of Spain and Italy and to the Mediterranean islands of Corsica and Capri. 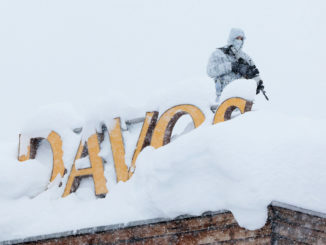 Dozens of roads were closed and trains and flights cancelled across the continent. Hundreds of schools suspended classes and some businesses advised workers to stay at home. Many regions were put on alert as the frigid temperatures were expected to continue until the end of the week. At least five people died in Poland while four deaths were reported in France, including a nonagenarian who was found outside the gate to her retirement home, AFP news agency reports. 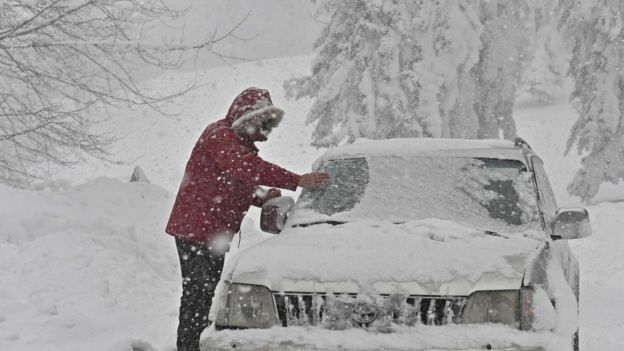 Three deaths were confirmed in Lithuania and two in Romania, including an 83-year-old woman found collapsed in the snow. A 47-year-old homeless man died in the Italian city of Milan. 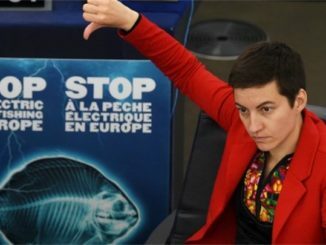 The toll across Europe could be as high as 24, AFP adds. 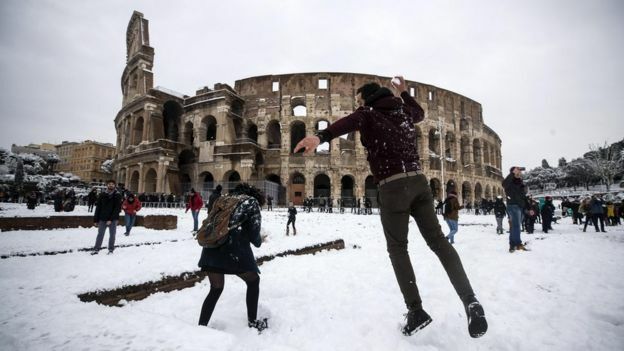 Rome saw its first snowfall in six years while Naples had its heaviest snowfall in decades. On Tuesday, snow was seen on the excavation site of the ancient city of Pompeii, near Naples in southern Italy – where the average February temperature is 6-14C. Germany’s meteorological office, meanwhile, recorded a temperature of -30C at Zugspitze, the country’s highest peak, and lows well below -10C in most of the country. In the French capital Paris, where temperatures dipped to -6C, commuters shared pictures of stalactites on the walls of at least two metro stations. 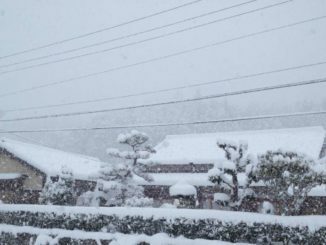 BBC Weather says biting cold winds are expected to continue in northern Europe while more snow should reach the UK and Ireland by Thursday. The UK is experiencing what is predicted to be the coldest week of the winter season in five years with temperatures reaching almost -12C in some areas.